I'm back. I have a few bits of randomness to share. First, confession time. A few months ago I stopped reading celebrity news. Okay, we'll call it what it is - celebrity gossip. The Lord had been talking to me about it for quite a while but one day He was so clear with me that I had to stop right away and not look back. Have you ever had one of those moments? It's like you know The Arm of Judgment is about to come down if you try Him one more time. I was visiting People.com a little too much and the Lord told me no more! And no more E! either. I've had a few times when I've nearly fallen off the wagon. Like, my head almost popped off just now when on Curt's ESPN show they said that Tom Brady and Giselle Bundchen had gotten married. I really wanted to read all about it and see pictures. Why do I care about this c-r-a-p? I don't know. I love stories and always have, which is a quality that can get me in trouble. Also, I noticed that since I stopped reading celebrity news, I've been much less tempted to gossip in general. It's always great when you finally get to stop confessing something that's been on the conscience for a while, right? The sins vary, but I think we've all been there. Second, Annabeth is getting noticeably bigger. Her little thighs are finally getting a little meat on them, her cheeks are filling out, and she's been able to wear some of her 0-3 month clothes. Of course, they're still big but they work. I need the Lord to send us a couple more cold weather weeks because I have some darling things for her to wear that require temperatures below 80. Houston is already there, people! 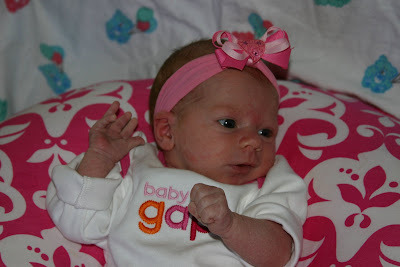 Today I had her in that sweet little outfit that was the first thing I ever dressed her in. It's almost too small now. The shirt is a little too short. I could hardly believe it. You know, baby clothes only actually fit for a week. The rest of the time they're either slightly too big or slightly too small. Third, we are seriously thinking about going to Disney World in early May before all the schools let out. We're hoping one or both of the grandmas will be able to go with us. Have any of you ever taken a three-month-old? How was it? Curtis is a huge Disney World fan. You should see how happy he's been since we started talking about this. 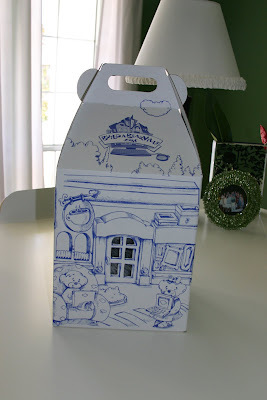 Have any of you ever been on the Disney Cruise? Enjoy your Friday night. I'll just be here on the couch, not watching E! or reading People.com. Thanks for all the encouragement on yesterday's post. I am going to close comments now and change subjects because it is a new day and I don't want to feel pitiful about it anymore. The problem is, I don't have any ideas yet for a new post. I'll be back when I do! I have depended so much on my hubby lately. He's been taking Jackson to and from school on Tuesdays and Thursdays. It's helped tremendously, particularly in the mornings. It's only a 15 minute drive, but then I'd actually have to get out of the car and be seen by people. And I'm not really sure I'm fit to drive so early in the morning. Today Curtis not only took Jackson to school, but he also offered to come home for the lunch hour and chill with Annabeth so I could join my mom and co-workers at Panera. How sweet! I took him up on it and had a great time with the girls. Then I thought I should buck up and try my first school pickup with the baby in tow. I really haven't wanted to take her in at such a young age. Can you imagine all the germs floating around in that air? *Shudder* And February has to be the worst month for the flu, RSV, and stomach viruses. I mean, everyone we know is or has just been sick. I got baby girl in the car and, of course, was running later than I had ever been. We arrived just in time. I had considered carrying her in the building in my sling, but opted for the stroller because of outfit issues. I draped a light blanket over her infant carrier to be her force field from germs. That probably doesn't even work, but it made me feel better. Inside we went, visiting with my friend Renee on the way. Everything was going well at that point. I felt some butterflies because I could tell that most kids had already been picked up. I hate that feeling. Then I arrived at Jackson's classroom. I quickly found out that the teachers began implementing a new reward system today. The little boys who obeyed the teachers well would get to take home a new Matchbox car. My little boy did not qualify for this reward. Dang. It. And he was absolutely devastated. Matchbox cars are the greatest thing in his world. So there I was, alone in public for the first time with my two children, and one of them was having the biggest meltdown of his entire life. Meanwhile, the teachers were meeting Annabeth for the first time. What should have been a sweet moment was a blur. All I could do was think about how to keep my son from spiraling out of control before we made it to the car. Oops! Too late! Let me be clear that I LOVE his teachers and his school. And I totally understand that this reward system is great and will bear much fruit, yada, yada, yada. But oh my word, this is not going to work for us. It cannot be like this every time I pick him up. Oh, please, please, Jackson, learn to obey your teachers the first time! As much as I'd like to voice how much this system isn't going to work for us, he is the one who's going to have to change. What seemed like ten minutes later, we finally arrived at the car. The weeping and gnashing of teeth showed no signs of stopping. Before we even got out of the parking lot, I was crying too. Not even from embarrassment or frustration. I was so sad for my boy. I know he didn't deserve a reward, but my heart hurt for him. He kept crying, "Race car at school! Race car at school!" Just picture your own kid at his or her most devastated state, and that's how Jackson was. It lasted ten more minutes until I threatened him with "rest time" once we got home and then found a suitable distraction. It may or may not have been a McFlurry. If it was, does that make me the worst mom of all time? Actually, don't answer that. I already know and I won't do it again. So I guess today was my first taste of one of my children experiencing consequences I had no control over. My brain says he needs it, but my heart says ouch. If this works it will be so great, but if it doesn't...it's going to be a long Spring. This morning I remembered that Sunni and my sister have asked me for this recipe a number of times and I have been too boneheaded to type it out for them. Sorry, y'all. I have no excuse. This recipe is from my co-worker, Nancy, who is very special to everyone in my family. Making recipes from people I love is preferable to cookbook recipes because it adds some joy to an activity I'm not really fond of nor good at. So here is Nancy's Chicken Cheddar Rice Bake. Melt butter in 3 qt. saucepan. Blend in flour and chicken bullion cubes. Gradually stir in milk. Cook over medium heat, stirring constantly until mixture comes to a boil. Remove from heat. Stir in chicken and mushrooms. Spread cooked rice in buttered 8" square dish; spoon chicken mixture over rice. Sprinkle with cheese. Bake at 350 for 30 minutes or until casserole is bubbly and hot. If I want to speak Curt's love language, this is what I make. We used to have this all the time during our five months in England. It was too expensive to eat out so I cooked almost every night. Big shocker, I know. We had a tiny dorm-size fridge, so we probably went to the grocery store every other day at least just because we couldn't store very much food. And I even had to do all our dishes by hand. What can I say but that God gave me the grace? We both agree that this meal tasted better over there, but we can't quite put our finger on what was different. I think it was either the richness of the butter or the chicken bullion cubes, which were a different size. Also, most of the time I use rotisserie chicken for this casserole. It's probably not as good, but it's a better option for peeps who can never cook their chicken just right. 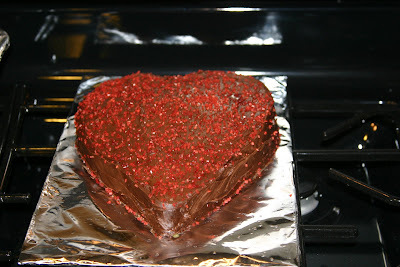 Well, leave it to me to write a long post about a recipe. Let's get a new bow already, Mom! If these people didn't bother me all night long, I wouldn't be so sleepy! I like to nap on the couch next to my Mom when she's blogging. The blanket under my head is in case I have one of my crazy urp sessions. 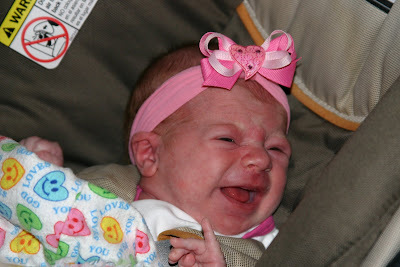 This was supposed to be a cute picture of me going on my first stroller ride. I wasn't real thrilled about it and we didn't even make it off the porch before Mommy changed her mind. I'm not gonna lie, y'all. The lack of sleep is catching up with me. It's hard. I want to be joyful and peaceful but the exhaustion provides for some maniacal moments. Yesterday I hit a wall. Curtis and I had taken turns getting up with Annabeth during the night - me to feed her and him to deal with the diaper explosions and spit up sessions that occur right as I'm falling back asleep. We were both really tired all day. The boys went to church in the morning and I went with my mom that evening. I'm so glad I did. First of all, I love the Ascend service. It's really energetic. If we didn't love our Sunday school class so much we'd probably go to it. Pastor Gregg is doing a series on the end times and he preached on eternal reward. It was extremely encouraging. My mind has really been set on earthly things. Colossians 3:1-2 says, "Since, then, you have been raised with Christ, set your hearts on things above, where Christ is seated at the right hand of God. Set your minds on things above, not on earthly things." Let's face it, I have a lot of mundane, earthly things to do right now. Like changing diapers, potty training (still! ), and cleaning spit up and poop out of mounds of laundry. It doesn't get more earthly than that. Don't get me wrong. I love the little baby that dirties the laundry, but if I could hand off the laundry responsibilities to someone else, I'd do it in a New York minute. I was reminded that if I do these things as unto the Lord, one day I'll be rewarded for them and I'll get to throw those crowns at the feet of Christ. That was exactly what I needed to hear. After church, Mom and I had a quick dinner at Chili's. That was nice since Curtis is on a Lean Cuisine kick right now and while I should be, I'm not. And you can probably guess I'm not up on my cooking these days. Once I got home, Curtis and I watched the Oscars. Slumdog Millionaire did pretty stinking well. Also, I love, love, loved Natalie Portman's pink dress. How beautiful was that? I wish I were wearing it right now! Wouldn't I be stunning in that gown while I sit on my red couch and blog next to my little Baby Elephant? Oh, you didn't know I have a baby elephant? You wouldn't know it by looking at her, but Annabeth's noises come straight out of the zoo. It's like she's got an inner trumpet or something. We put the baby down and went to bed around midnight. And, glory to God in the highest, I only had to wake up ONE TIME to feed her before morning. It was wonderful. I almost feel like a new woman today. I'm so pumped because when Curtis gets home he will find both kids bathed and dressed, his wife with clean hair and even makeup on, the house in order, and the laundry in process. And I even worked this morning. It has been a good day. Look what a little church and a little sleep can do. Happy Saturday, everyone! Since apparently I wasn't the only one who didn't get the memo about not taking baths post-partum, I decided that after two weeks I was ready to jump in the tub. It's been nice. I also feel the need to clarify that pregnant women are allowed to take baths, but you're not supposed to get the water too hot. Or maybe you get it hot anyway and just feel bad about it. Yesterday was a big day for us. 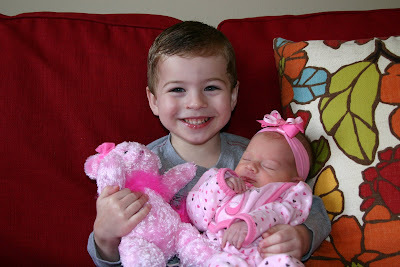 Jackson had his three year checkup and Annabeth had her two week checkup at 8:30 a.m. If you're thinking that was a little ambitious so early in the morning, you're right! When we were walking out the door, Curtis decided to tell me he thought he was going to throw up. Awesome! I was a little ticked, although that was ridiculous because he couldn't really help it now, could he? I told him to go back inside but he didn't listen. He said, "You cannot do this by yourself." I knew he was right. So off we went and we were even on time! 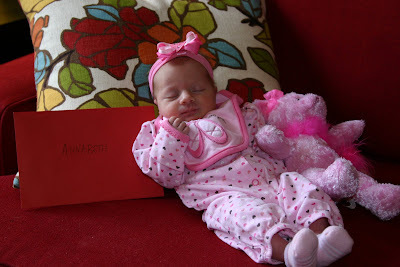 Annabeth is now 7 pounds 2 ounces and 20 1/4 inches. 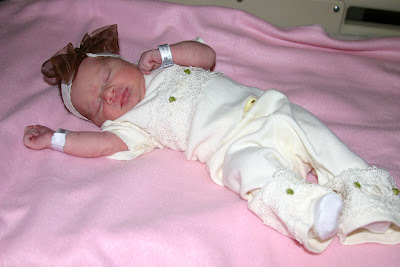 (She's the same size as Jackson on the day he was born.) I was thrilled to find out that she had gained a pound in just two weeks. Way to go, sister! She is in the 10-20% for height and weight. Jackson is currently in the 80-90% for height and weight. 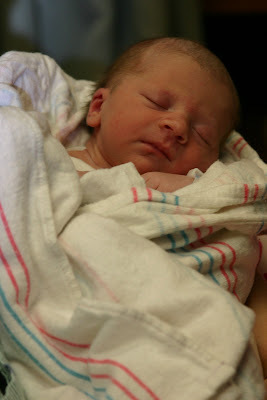 When I was expecting him, Susan Kirby prayed for him to be "hardy" and the Lord surely did answer that prayer. 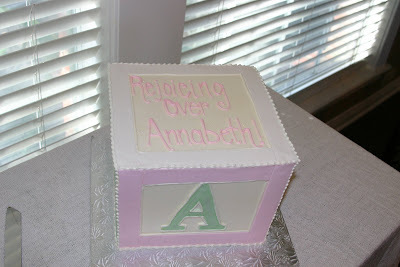 (Which is why I was so pumped when she prayed for Annabeth to be a "peaceful presence" in our home.) I was extremely thankful that my boy didn't have to get any shots. 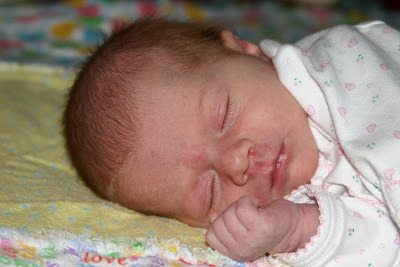 Annabeth had one shot and her second newborn screening heel prick. Bless her heart. After the appointment, we went back home and Curt got his sick self in bed. (After a nap he felt much better and never did get sick.) A friend from Sunday school dropped dinner by and that was so nice. (If you're not active in a church, you're really missing a blessing.) 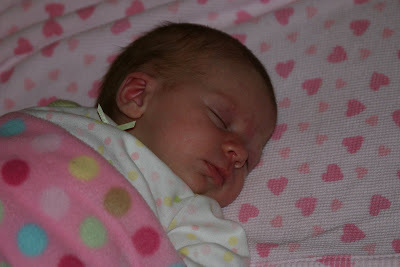 Soon it was time for me to take Annabeth to another appointment. This time we had to go to the hospital for her to have an ultrasound on her hip. 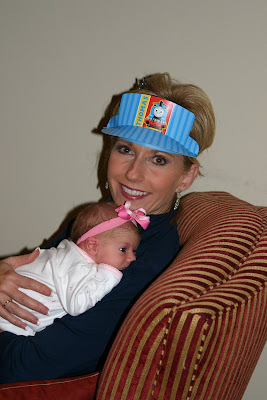 The first doctor who saw her in the hospital after she was born noticed a hip click - whatever that is. Her pedi never noticed it, so I wasn't too worried about it. In fact, I never looked it up on the internet or asked what it meant. I'm glad I didn't borrow trouble because the ultrasound showed that her hips looked great. Praise God! 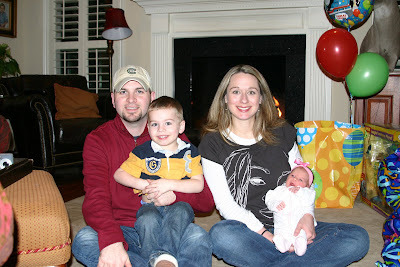 We dropped the little ones off at my parents' house a few hours later and headed to see the movie Slumdog Millionaire. Let me preface this by saying that it is very, very rare for us to see an R-rated movie. Curtis did a lot of research on this one and we decided it was something we wanted to see. It's about three little orphans - two brothers and a little girl - who grow up in the slums of Mumbai, India. At the age of 18, one of them makes it onto Who Wants to Be a Millionaire and is on the brink of winning it all. The police arrest him because they believe he's cheating. The movie takes you through each question he's faced with on the program and shows the circumstance that caused him to know the answer. I missed the first 10 minutes because I was getting popcorn, but I was glad because the movie opens with a torture scene. This was not really a popcorn kind of movie. The brutality of life for these orphans was extremely difficult for me to watch. It's hard knowing that these kinds of things really happen. At one point I looked at Curtis and said, "I cannot watch this. I have to leave." Since he already knew everything about the movie, he knew the worst was over and encouraged me to stay. I'm glad I did because it was a very impactful movie. Slumdog Millionaire has been nominated for 10 Oscars and it's not hard to see why. As you know, Curtis went to India last fall to see how we could partner with an organization called CharAsia. 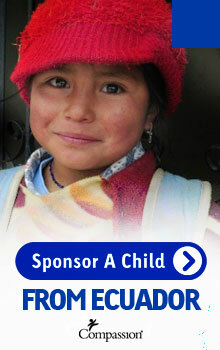 CharAsia takes in the children of prostitutes and gives them a safe place to live, be educated, and learn about Jesus. They literally save these kids (mostly girls) from being entrapped in prostitution themselves. Throughout the movie, Curtis kept saying, "I saw that!" and "I was standing right there!" He and Jerrell actually saw the slum that this movie was set in. I'm so thankful that I got a glimpse of that world. I cannot get those children off my mind. Lord, help me to pray for them daily and do what I can to help. After the movie we picked up Annabeth from my parents' house. Jackson spent the night there, which he was thrilled about, so that we could get a little more sleep in the morning. What a blessing. On the way to their house he told Curtis and I not to walk him in the door. "You stay here, Mommy. You stay here, Daddy. You not come in." He just wanted us to let him out of the car and knock on the door by himself. Wow. This morning when they were bringing him home, he told my parents that his name was not Jackson Jones. His name was Little Boy and he could not go home to Jackson Jones' house. He is such a turkey. Even though this post is already incredibly long, I have to say that I am loving being so close to my parents right now. My mom and Curtis keep commenting on how much better my attitude is than it was when Jackson was born. Praise God for that! There are a handful of things I can attribute that to, and one major one is being just 15 minutes away from my mom and dad this time. They have gone out of their way to help us with everything from bringing us food, taking me to run errands, babysitting at our house, babysitting at their house, to just keeping me company when I'm getting cabin fever. Mom always said throughout my pregnancy, "You have only begun to love me. Wait til you have that baby!" She was so right! Thanks, Mom and Dad! I'm sitting cross-legged on my couch, obviously with my laptop, and there is a little pink bundle laying next to me. She has been asleep for most of the evening but she's showing signs of trying to wake up. When she gets hungry she starts pumping and flailing her little arms everywhere. Like a cheerleader. I'm not sure how I feel about that, but it's cute. I've been making a mental list of things that are different now that I'm no longer pregnant and consequently have a newborn. Number one. Thank You God, I do not have to visit the ladies room every 20 minutes. Number two. My lactose issues have returned to me in full force. Holy dairy cow. Number three. When I crawl in bed at night, I am usually shivering because it's so cold in our room. 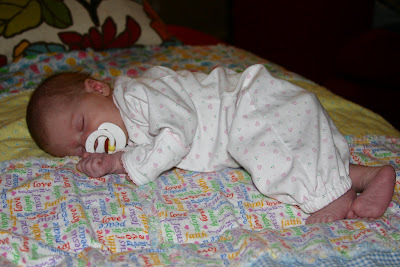 But every time I wake up to feed Annabeth or roll on my stomach just because I can, I find myself in a pool of sweat. It is so gross. Number four. My second day hair is no longer presentable because of number three. Trust me, it's funktified. Number five. I'm dying to take a bath - a bath so hot that it will give me a fever or nearly make me pass out. In case you do not already know this, when you are expecting, you're not supposed to take hot baths. And after the baby comes you have to only take showers for a certain length of time. Um, I'm pretty sure I didn't know that first time around. Oops. Number six. It is no longer my stomach bumping into things. It is the B's of DOOM. I've put doom in all caps because they are so doominous. Although I'm no longer channeling Pamela. Thank You again, God. Number seven. Because of my lack of sleep, which is taking its toll after two weeks, my vision is a little blurry and it's hard to read things on the computer. Number eight. 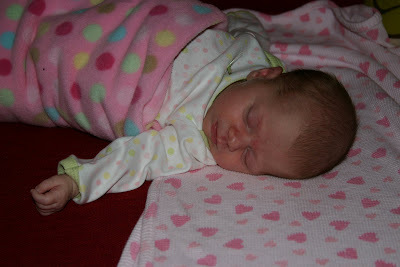 I couldn't wait for Annabeth's umbilical cord stump to fall off. That is, until it did tonight and I almost cried. Why? Why did that make me emotional? Number nine. Help. I can't stop watching old reruns of 90210 on the Soap Network. I can't decide if this is more or less shameful than all the Days of Our Lives that I watched during my maternity leave when Jackson was born. I had totally forgotten about the character Gina. She is HORRIBLE! Number ten. My little cheerleader is practicing her moves. Gotta run. 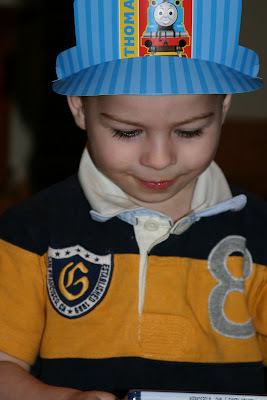 Oh my goodness, my little boy is three years old today! 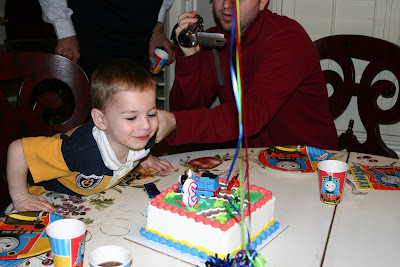 I have mixed feelings saying goodbye to age two. In many ways it was a magical year. Jackson learned so much and it was incredible seeing his speech develop. On the other hand...wow...potty training and discipline have not been easy. 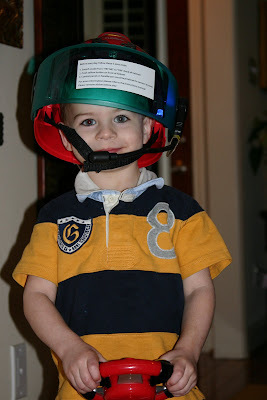 I have asked God that age three would be easier when it comes to discipline. It doesn't hurt to ask, right? I'm looking forward to seeing what changes and growth this year will bring. 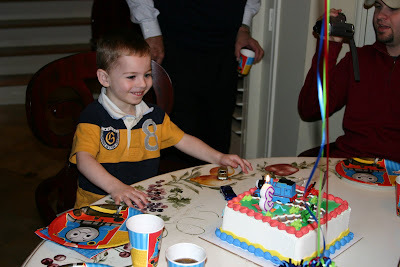 We celebrated the birthday boy with a small family party at my parents' house last night. I asked my dad to do a fish fry for us and he graciously obliged. His friend even happened to go fishing and drop a bunch of fresh fish off at the house the day before. The Lord provides! Besides the fish, we had homemade tartar sauce, corn on the cob, hush puppies, steak fries, and macaroni and cheese. It was a feast. 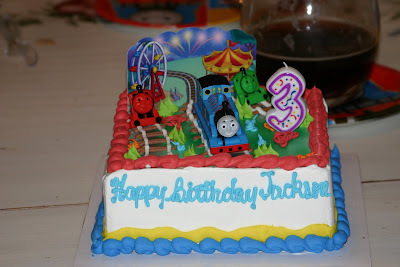 My parents have no idea how much they blessed us by hosting Jackson's birthday party and providing such a great meal. I toyed around with doing a friend party, but I was praising God yesterday at about 5 p.m. that I didn't do it. I was about to drop with exhaustion and had a bit of a sore throat. It was so nice just to show up and not really be a hostess. Next year we'll be back on, but this year being low-key was exactly what we all needed. 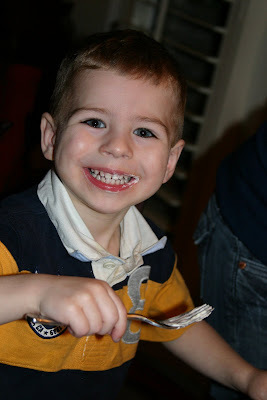 Jackson had a blast being the center of attention, opening presents, eating cake, and even devouring his dinner! Thanks Mom and Dad! 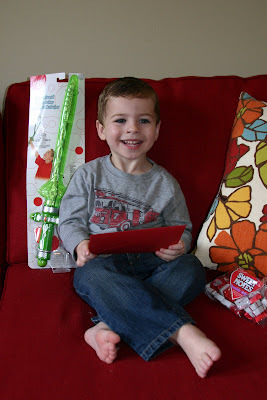 This is the bubble sword Jackson got for Valentine's Day. A couple from our Sunday school class brought us dinner on Saturday night. Look at this cake my friend Susan made us! She's every woman! 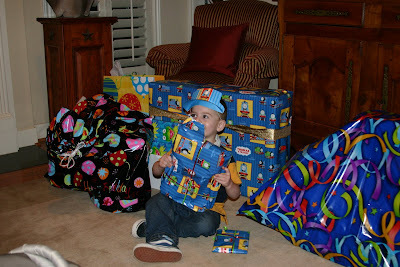 At his party, Jackson tore through his presents at record speed. Our first decent pic as a family of 4. Our only other one is on my hospital bed and trust me, it isn't cute. 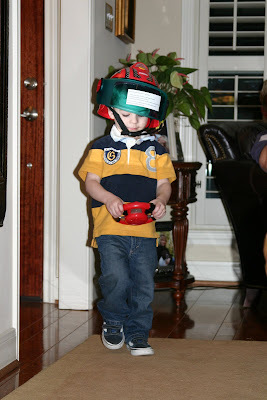 Jackson LOVES his new race car helmet and steering wheel. It speaks to him and tells him where to go. He did laps around the house with that thing for about 30 minutes. It was hilarious. 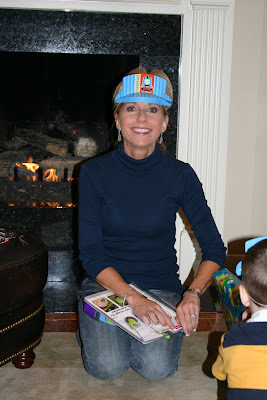 Thank you, Mother, for embracing your Thomas the Train hat. 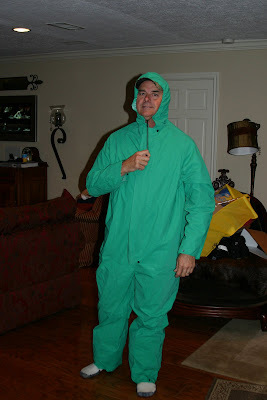 Dad was embracing his hazmat suit. My girl is two weeks old today. 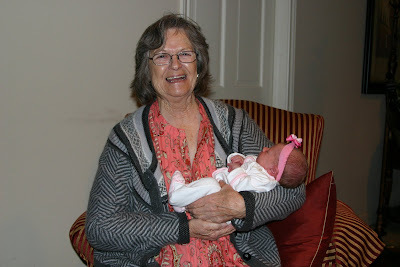 Memaw with her first great-granddaughter. This is an ice cream cake from Baskin Robbins. I remember having a Smurf and a Rainbow Brite cake from there when I was little and I thought it would be fun to get one for Jackson. It was so good! It was vanilla cake with cookies and cream ice cream. Missy is coming over today to meet Annabeth and we are eating the leftovers. I'm trying to have self-control until then. 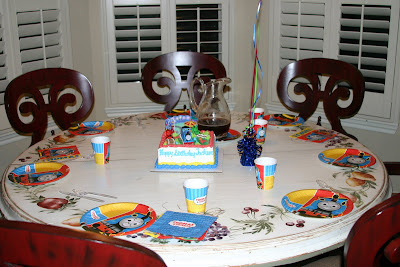 The Thomas plates really enhance my mom's table, don't they? Jackson right before he left for school this morning. When I saw what Curtis dressed him in this morning (a gray t-shirt), I said, "Babe, it's his birthday! He needs a better outfit!" I'm not sure men understand that concept. Then he changed him into this handsome shirt that was a gift from Nana. Thank you, Nana! I sent cupcakes from HEB for him to share with his classmates. If his teachers never speak to me again, I'll understand. All they had was frosting in Mardi Gras colors - purple, green, and yellow. Oops! Curtis and I celebrated a little early this year. My parents kept the kids (still so weird to say that) at their house last night while we went to see a movie. Since we didn't really have time to do dinner and a movie, we went to one of those theaters where you can order a real meal and eat it while you're watching. We saw Confessions of a Shopaholic. I was stunned that my husband suggested it and even more stunned that he laughed throughout and actually liked it! It was super cute and only PG. It's always nice to leave a theater and not have to feel bad about what you just saw. Anyway, Curtis had two gifts for me. The first gift was a pair of silver hoop earrings from Banana Republic. I LOVE them! And the second was a small box of Godiva chocolates. Praise the Lord. I lerve Godiva. My man did so good! Curtis cut me some slack this year since I couldn't really do much shopping. I could only think of things to get him at Best Buy and he has a ton of gift cards to there from Christmas that he hasn't even begun to use. What he wanted, he said, was a free pass to go to a movie one night and see something guyish. Granted! I think he's going tonight. I hope he doesn't feel weird alone in a theater with a hundred couples. I did get him a card, since words are my love language and all. I got the kids' valentines at the grocery store. It was a nice chance to get them surprises that don't cost much. Jackson got a card that lights up. It was so cute. 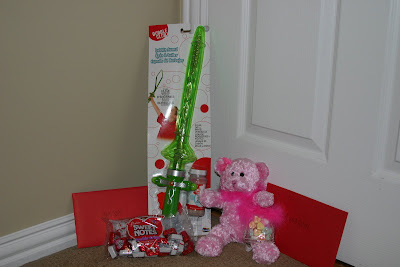 He also got a sword that makes bubbles and a bag of chocolate candy. Annabeth got a Sesame Street card and a pink teddy bear wearing a feather boa and carrying a purse full of conversation hearts. She donated her candies to her brother. It seriously irks me how bad Annabeth's pink stuff clashes with my red couches in all our pictures. If only I'd known I would have a girl! This is officially my favorite picture I've ever taken: my two February Valentines. Kristi Walker fought the good fight and this morning she finished the race and was welcomed by her Savior into His glory. Thank you so much for praying for and encouraging our friend and her precious family during her battle with cancer. I know we will all continue to lift up the Walker, Winters, and Savage families as they grieve the profound loss of their wife, mother, daughter, and sister. "He's been so good today." I'm not even kidding when I tell you that every single time these words are uttered about my son, he turns up sick the next day. When he starts feeling bad it just dials his strong will down a few notches and makes him a bit more compliant. Last night when Curt got home from Wednesday night church, he said those fateful words to me. I thought it was strange because Jackson had really been a handful all day. I'd told Curtis that morning that he'd probably need to have me committed by the day's end. So I was quite surprised and, honestly, a little dismayed that he'd been so good for his dad. Why, WHY, does he have to be so ornery with his loving mother who birthed him from her very own body three short years ago? So this morning after I fed Annabeth, I went into Jackson's room because I could hear him talking. When I walked in I saw him covered in something gross. It took me a minute to figure out whether I was looking at poop all over his legs and sheets or puke. When I saw his face, crusted over with vomit, my heart sank. He had gotten sick in the night and somehow it did not wake him up. I have no idea how that happened. Thankfully, that one episode was all it was. In the morning he had plenty of energy and wouldn't stop asking me for food and juice. I felt so bad, but all I gave him was crackers and a little water. By nap time he really did seem sick, but there was no more throwing up. Then he slept three hours. Bless his heart. I'd be lying if I said I didn't spend a good part of the day obsessing about how much I hope this doesn't spread to Curtis, Annabeth and me. But I realized that the last time the stomach virus visited our family was exactly one year ago, right before Melissa's wedding. That is something to be thankful for. Granted, I did pay some major dues with all my morning sickness last summer. Annabeth is having her first fussy evening, right as we sit down to watch The Office. So I must go. But before I do, I have to acknowledge that today is/was my due date. I'm so thankful not to still be pregnant on this day. And I'm so, so, so thankful to have that little sprite already here in her swing in my living room, even if she does fuss all through our favorite show. Y'all. I just got the Itzbeen Baby Care Timer. It's amazing. I'd seen it here and there but never felt like spending the money on it. I got by just fine without it before. I finally broke down when I saw it at Target a few days ago. This thing is going to change my life. I've been using it for about 24 hours and I'm in love with it. Here's how it works. There's a button for diaper changes, a button for feedings, and a button for sleeping. Whenever Annabeth gets her diaper changed, gets fed, or goes to sleep, I just press the corresponding button one time. Then it keeps track of how much time has passed since that occurred. It even has a bonus timer for anything else I want to keep track of. I'm using that to time Jackson's potty breaks. I pretty much nurse on demand at this stage, but I still need a guideline to help me. I had been using my cell phone alarm for the last week to keep track of when it was time to feed the baby. But setting that thing is so complicated and half the time I do it wrong. Luckily, this timer also has an alarm feature. This little gadget is going to set me free. That is, if you consider keeping track of how long it's been since you last changed a diaper, fed the baby, or put her down for a nap, setting one free. To some that might not sound like freedom. So if you are pregnant or have a little baby, spend the $25. You'll also need a pack of AAA batteries. But if the batteries die tomorrow, I swear I will issue a retraction. Take a deep breath. Maybe put in some eye drops. Here's Part Two. After we arrived at the hospital, we were quickly taken to our room. They called it Lucky Number 13. I changed into my hospital gown and felt that it was slightly less hideous than the gown I wore at Baylor Grapevine. Nurse Cassandra immediately hooked me up to the fetal monitors, which were two big sensors strapped to my tummy. Those things were terribly annoying because they shifted and caused blips on the monitor screen if I moved too much. Plus, they made it hard to feel the baby move. I made sure to take in her last kicks from the inside. Truly, it is the most wonderful part of pregnancy and it's something I will be sad not to experience again. Then I got my IV, which was even more annoying than the monitors. My nurse complimented me on my "beautiful veins" - something only a nurse would say! Then she put some crazy painkiller in my IV that knocked me out immediately. For the next hour I had the wildest dreams. I was seeing these weird scenes in my mind for five minutes at a time. Then I would open my eyes and study the monitor and see how we were doing. As soon as I closed my eyes, I got a new scene. It was so bizarre! I don't think I ever truly slept, but I was as relaxed as could be and that was better than being scared at home in my bed. I cannot forget to say that I did get a good back rub from Curtis while I labored. For the past three years I've given him a hard time about not getting the back rub he was trained for in our birthing class with Jackson. 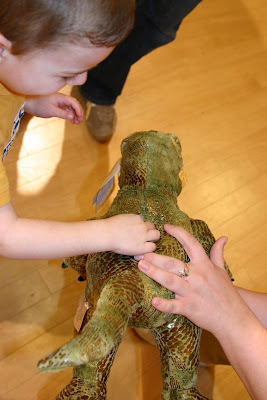 In fact, in that birth class he made me rub his back in return, which our instructor was horrified by. That's my man! He is a very selfless person except when it comes to back rubs. And he'll readily admit it. So I have to give him credit for initiating and executing a good labor massage. At 7 a.m. Cassandra started me on the pitocin drip. I was supposed to start at 6:00, but the baby's heart rate had suddenly dropped when I changed positions and she wanted to observe her before getting things started. Our sweet nurse clocked out shortly after and we got our new nurse who was with us until Annabeth came. They could not have been more different in personality. Our new nurse was very down to business and not the kind of person you could butter up, but she was great at her job. We heard she was one of the best nurses in the hospital. We were very blessed. "'Be strong...and work; for I am with you,' says the Lord of hosts. I can do all things through Christ who strengthens me. [Be] strong in the Lord and in the power of His might. The joy of the Lord is your strength. Strengthen weak hands, and make firm the feeble knees. Say to those who are fearful-hearted, 'Be strong and do not fear!' The Lord turned to him and said, 'Go in this might of yours.' Let us not grow weary in doing good, for in due season we shall reap if we do not lose heart. Thanks be to God, who gives us the victory through our Lord Jesus Christ." Childbirth is amazing but there's a lot that can go wrong. You walk pretty close to the valley of the shadow of death to bring a new life into the world. Those verses were just what I needed. The anesthesiologist came to our room about 15 minutes later and put me out of my misery before I was even miserable. They told Curt to leave the room for 20 minutes. The nurse held my hand while the doctor did his thing. Shortly after I was blessedly numb. They had me lay flat on my back and I immediately started to black out. I said, "I don't feel very good. I think I'm going to pass out." The nurse gave me an oxygen mask and that helped. I remember telling the nurse I didn't mean to be so high need. I felt embarrassed. I kept the oxygen for the rest of the time. The mask was not as uncomfortable and annoying as the one I had to wear with Jackson, which I was constantly getting in trouble for trying to take off. 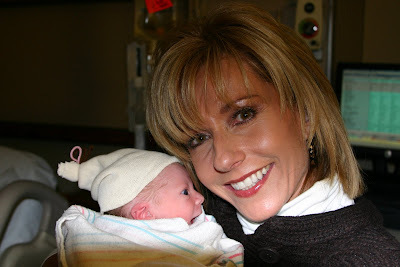 I distinctly remember thinking that I, with my epidural tube taped to my back and numb from the waist down, a blood pressure cuff attached to one arm, an IV attached to the other arm, four plastic hospital bracelets, a catheter, and an oxygen mask, was as far from natural labor as it gets. It was utterly ridiculous to think about myself in comparison to how Eve must have given birth. Still, I would not have chosen to do it any other way. At about 9:00, my OB came in and broke my water. It didn't hurt, but I could feel the pressure and was very, very glad I had already gotten my epidural. Thank You, Lord. It was not as dramatic as when it happened with Jackson. By then I think I was dilated to a 5. My mom and Curt's parents arrived sometime around 10:00. Mom had taken Jackson to mother's day out, the timing of which was a very big blessing. 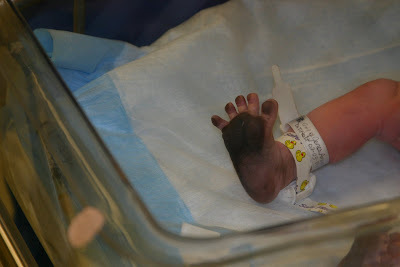 By this time my labor was well underway and I could even feel some cramping on one side from the contractions. The nurse put a pillow under my hip to even things out. Then I started to feel cramping in the middle of my stomach. It wasn't horrible, but I was a little concerned about what it would feel like at the end if it didn't get fixed. My nurse was hesitant to mess with it since I nearly passed out before. As time wore on, I was definitely in pain and had to breathe through the contractions. Luckily, things went pretty fast. Soon I was dilated to 9 cm. At that point I sent my mom scurrying for my hair brush and makeup bag and Curtis scurrying to get the cameras ready. I put on some lipstick and Benetint cheek stain (best stuff ever) and mascara. I started feeling pressure a little after 11 and the nurse checked me again. I was dilated to 10 cm. Our parents left the room and the nurse went to call my doctor. Alone for a minute, Curt and I took the chance to pray together. 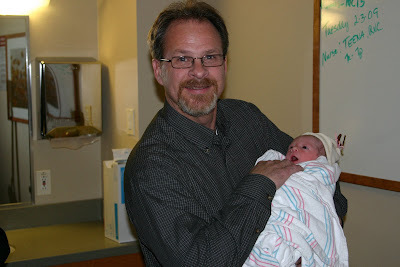 I don't remember exactly what Curt said, but he prayed for a safe delivery and a healthy baby. He thanked God for our new baby and for our son. When he did, his voice quivered. That moment will stick out in my mind as one of my favorites in our marriage. Our nurse came back in and said the office staff had tried to put her on hold when she called the doc. She'd told them, "No, you cannot put me on hold!" We were more than ready to go. 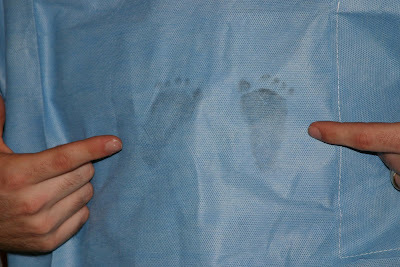 The doctor arrived quickly and baby girl was ready to make her entrance. At this point it went very fast. I was already having a contraction when everyone got into place, so they told me to push. 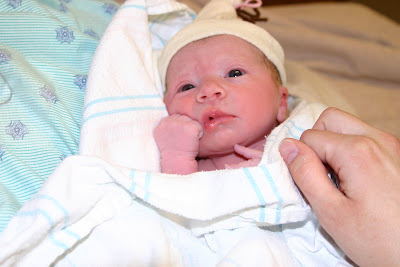 I pushed maybe five times through that one long contraction and Annabeth was born! Curtis and I couldn't believe how quickly she came. He didn't even have to do any counting! The doctor put the baby in front of me and Curtis and I both leaned in to make sure she was a girl. She was. Thank God! I heard them say something about the cord being around her neck, so I was eager to hear her cry or see evidence of her taking a breath. The doctor clamped the cord and said, "Let's get you crying for your mommy." She did start to make some noise at that point and I was relieved. They wiped her off quickly and laid her on my lap. Curt cut the cord. Her whole body was purplish. I literally watched her skin turn pink over the next few minutes. It was awesome to see the process of a new life entering the world. I watched as she started blinking her eyelids and squinting. I was literally looking at her eyes when they opened for the first time. A very blurry image of me - if she could even see that far - had to have been the first thing she saw. They put a blanket around her and I held her for the first time. 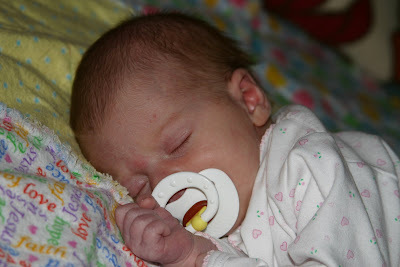 I felt bad because she was really crying, but I couldn't soothe her very well while I was just laying there. Curt and I leaned in and spoke to our little girl and told her how pretty and tiny she was. Her head was perfectly shaped, unlike poor Jackson's. He definitely made the way for his sister's easier delivery. Bless his heart. He bounced back quickly though. Initially, we didn't think she looked very much like her brother. But as the day wore on we changed our minds. Soon we had our first attempt at nursing. It did not go as well as it had with Jackson after he was born. She was not that interested in nursing for her first 24 hours of life. We came to find out that she had a lot of gunk in her tummy and once she had coughed it all up, she was finally ready to eat. I was very eager for Annabeth to get hungry because she was just so small! I didn't want her to lose a lot of weight. Curtis quickly sent a text message to our parents that said, "Baby girl!" They later told us how shocked they were that it happened so fast. With Jackson, Curtis got in trouble for not notifying our families for an hour after he was born. We would not make that mistake again. Eventually we summoned our parents in and they got to meet their granddaughter for the first time. My dad had also arrived by this time. Curtis took some pictures of everyone taking turns with her while I videotaped it from the hospital bed. We were all so full of joy. It happened to be my father-in-law's birthday and that made it extra special. I love that we have a picture of the birthday boy and the birthday girl together. 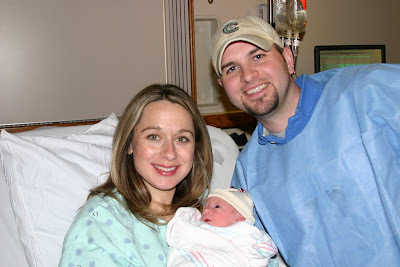 We were so thankful for God's perfect timing for our daughter's birth. The fact that we were able to have both sets of our parents there with us, as well as my sister later that day, was absolutely wonderful. Since we had not planned on having a scheduled birth this time, we knew we were taking a chance that we could be alone when she was born. We were at peace with that possibility and trusting the Lord with it, but we were obviously hoping that they could all be there. Curt's parents live 12 hours away and my mom had a conference in El Paso the following weekend. My dad as well as my mom's BFF Johnnie were on call to be with Jackson in the event that Bibby and Nana weren't nearby. It could not have been better timing, except for the fact that mom had to teach Bible study THAT NIGHT! But the Lord even took care of that. 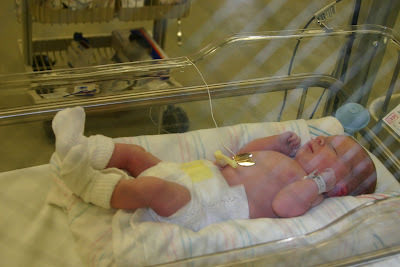 She'd already done all her preparations and, mercifully, Annabeth was born early in the day. It was actually really fun knowing that she was going to get to announce the baby's birth to all our Bible study girls that night. We were even able to get them some pictures to show on the screens. Thank you to everyone who prayed for us during this pregnancy and during my labor. I know that God heard your prayers and that a thousand things probably turned out better than they would have otherwise because you all prayed. That is huge to me. From the bottom of my heart, thank you. We are thrilled to have our sweet Annabeth here with us. She has been a delight. I have much more to say about our princess and now that I've gotten this birth novel out of the way, I can do that! I will go ahead and warn you that this is going to be the longest birth story of all time. I'm mostly writing this for myself so that I can remember every little thing. Sorry in advance for the length! Rewind to the weekend of January 30 through February 1. We had deemed it "Jackson weekend." 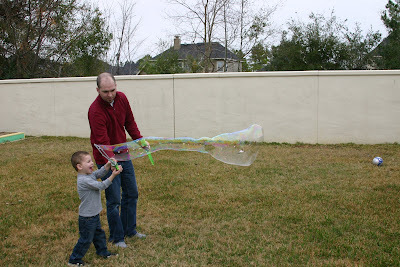 We wanted to do things that were fun for our little guy since his world was about to change in a big way. Plus, his birthday is coming up on the 17th and we knew it would be hard this year to celebrate like we would want to. So on Saturday we took Jackson to a Build-a-Bear store. First we let him make a stuffed animal for himself. 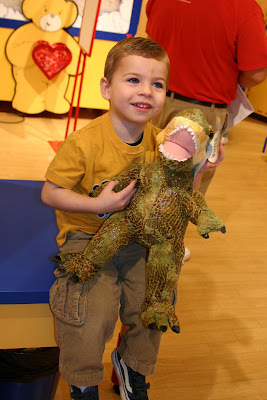 He chose a t-rex dinosaur and he had lots of fun doing that. 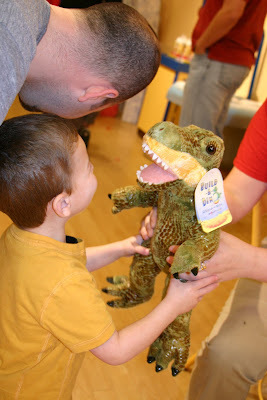 Then we told him he was going to make a stuffed animal for Annabeth. 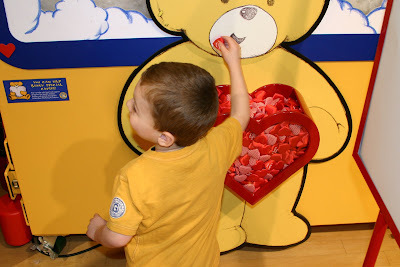 He picked out a koala bear and then went through the whole process of putting the heart in, stuffing it, etc. Someone had given us this idea through a blog comment. Thank you! Jackson totally understood what he was doing and was excited about it. That night, as you know, we went to Monster Jam. Between the mall and walking through the parking lot of Reliant Arena, I had to have walked at least a mile that day. On Sunday I toyed around with the idea of not going to church. I was tired and felt very pregnant and not that cute. But I decided that it was mostly vanity that made me want to stay home and I sucked it up. I thought maybe God would bless me for going. And He did. We had a guest speaker since Pastor Gregg was in Israel and he did this amazing presentation on creation. He narrated with Scripture after Scripture (from the creation account in Genesis and all throughout the Word) while we watched the most beautiful pictures of earth and outer space on the huge screens. It was so awesome. The Lord has been showing me that I had been really self-consumed and that I had been putting my hope not in Him, but in having my baby. All I could think about was going into labor, etc. By the end of the service I was put in my place. It was a great feeling to be relieved of my self-importance. After church we went home and all took naps. That evening I had to run into the grocery store for 5 minutes and then I went to my friend Melanie's house to meet her new baby, Laney. Mom and Dad wanted us to watch the Superbowl with them and my grandparents, but I was too spent to do anything but veg on the couch. On Monday morning I woke up in a great mood. I was bathed and had the house in order before Jackson ever stirred. We enjoyed our breakfast at the table together and then I had a great quiet time. I told the Lord that I was putting my hope in Him that day and that I trusted Him with everything. It was beautiful and cool outside. I resolved that Jacks and I would get out and enjoy the day together. 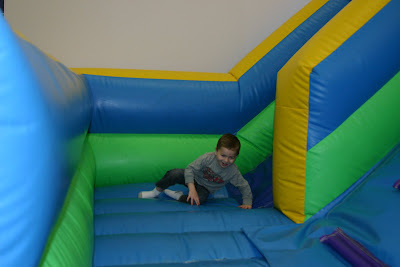 I decided to take him to a bounce house place. 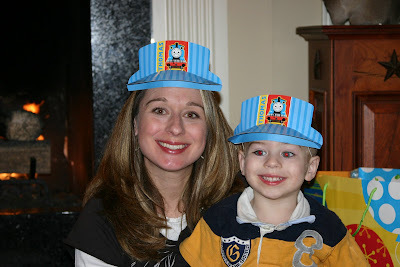 I invited my friend Jenn and her boys to join us. We went and had a great time. Jackson needed my help getting into some of the inflatables, so I picked him up over and over again. And I asked Jenn if she thought I'd go into labor if I got in one and bounced. Don't worry, VVPG did not get her big old self into a bounce house and jump around. But if it had been my due date, I would have done it! After that we took the kids to McDonald's. We strategically planned to go to one inside a gas station because it didn't have a playland. Smartest move ever. After that, Jackson took a nap and I got ready for my doctor's appointment. When he woke up, I dropped the Mister off with my mom and headed to the doctor's office. I waited an abnormally long time for him to see me. I was getting more ticked by the minute because I knew I was waiting and waiting to find out that I had still not progressed. Remember that on Friday I was absolutely not dilated or effaced. Posterior is the word that was constantly used. Whatever that means. The doctor came in to check me and I nearly fell off the table when he told me I was 3.5 cm and very favorable for labor. Holy cow. I couldn't believe what I was hearing. Are you serious? ARE YOU SERIOUS? Since I was already 38 weeks and 5 days, he was not inclined to have me walking around in such a state. He felt that we would be risking infection or me not getting to the hospital in time if I remained that way for long. He felt that the safest place for my baby was in the nursery. So we planned that I would show up at the hospital at 6:00 the next morning and they would augment my labor. Meaning, they would get my contractions into a regular pattern using pitocin. He assured me that if it were his wife in this situation, this is what he would have her do. 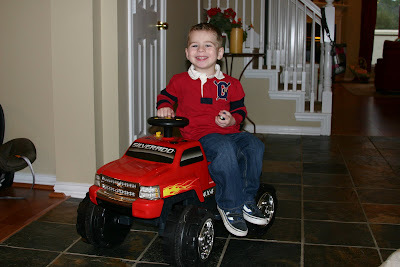 He emphasized that if we needed to go to the hospital that night, then we shouldn't wait. They wouldn't turn us away at that point. He left the room to call the hospital and I called Curtis to tell him the huge news. We were both bewildered and excited. As I left, the nurse that I had gotten so used to seeing hugged me and we said, "See you in four weeks!" She was really happy for me. On the way to my mom's, I called my friend Michelle to say I wouldn't be riding with her to bunco that night. 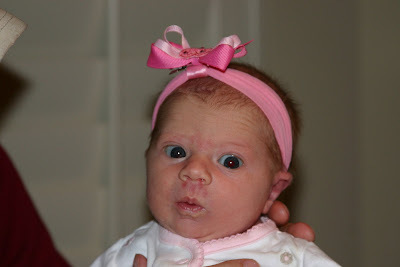 Then I burst in the front door of my parents' house and said, "We're having a baby tomorrow!" They were as shocked and excited as I was. I took Jackson home and Curtis and I went into a frenzy of preparation. It was hard because I wanted to have a memorable evening with our son, but there was too much to do. It was a good thing we'd already had such a fun weekend and a great day. We put him to bed and I didn't let myself get real emotional about it. For some reason he had trouble falling asleep and was still talking to himself an hour later. That never happens. Mom planned to be at our house at 5:30 the next morning to take over. During that hour I washed my hair and Curt got us some Chick-fil-a. The doctor had said to eat a good dinner but have nothing past midnight. I only ate half a sandwich because I was so nervous. I started getting really scared that my water was going to break at any second and then my contractions were going to get unbearably painful before I could get to the hospital. When I labored with Jackson, my water broke on its own in the hospital bed and then my contractions suddenly got very bad. I had already asked for my epidural at 3 cm and I had to wait an hour before the guy arrived to do it. I guess I am still traumatized by that hour of waiting. I know I sound like a weenie. So the fact that I was already dilated past that point was really messing with me. I was having contractions as always and because of all the day's activities, there were a ton of them. I had one painful one and called my mom before it was even over to ask her to come and get Jackson. What if we needed to go that night? Thankfully, he was still awake. He was totally excited to go back to Bibby and Pappaw's house. They came to get him and everyone was happy. We finished getting ready and got in bed as soon as we could. I was thankful that my house was already in order. The baby's room still didn't have curtains, but it was okay. When I finished doing my hair, I breathed a big sigh of relief. I got in bed and started counting contractions. They were not 100% regular, but close enough for me to obsess about whether we should be at the hospital or not. I could not make myself go to sleep. So if I couldn't sleep anyway, I thought it would be better to "not sleep" at the hospital where my baby could be monitored and my epidural was close by. The car was already loaded; we just threw our clothes on and jumped in. 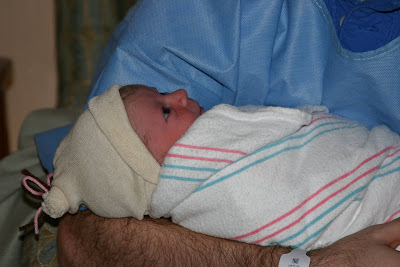 Curtis and I arrived at the hospital at 2:30 a.m. When we got to the nurse's station, they told us they loved it when their scheduled patients arrived early. I'm not sure why that is, but it made me feel really good. Then, as the Lord would have it, we were paired up with the night nurse we had during our dress rehearsal on Friday night. That was such a blessing. She could not have been more wonderful. Props to Nurse Cassandra, who was with us until 7 a.m. I'll go ahead and end here since my baby girl needs to eat and I'm sure your eyes are glazed over. Part Two to come! In the meantime, here are some pictures. I think someone asked to see the cake from my LPM baby lunch. Is that cute or what? Here we are at Build-a-bear. 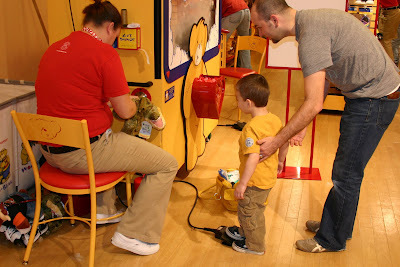 Jackson's pushing a pedal that pumped the stuffing into the t-rex's body. Putting the heart in his t-rex. As Jackson would say, "Whas in'ere?" 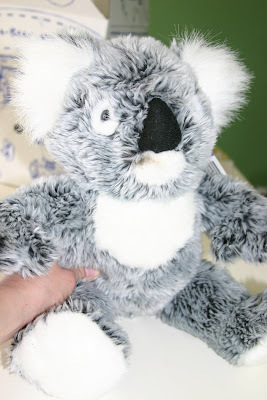 Annabeth's koala, made with love by her big brother. 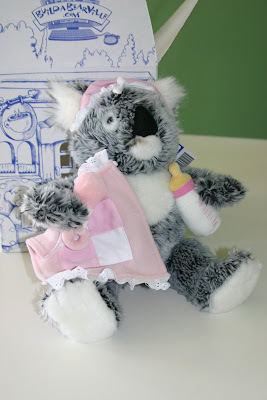 It's debatable whether the pink baby accessories that we got for free made Annabeth's Koala look cute or so-ugly-it's-cute. 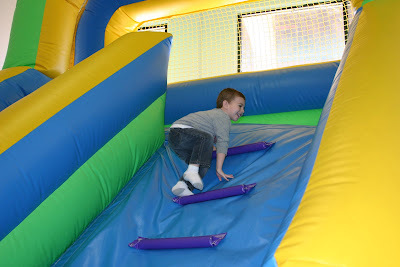 At the bounce house place. 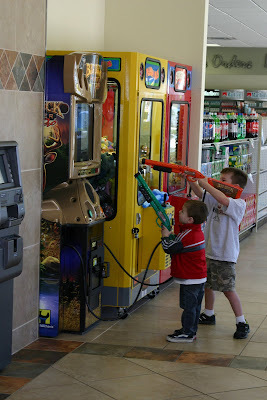 There was no playland in the gas station Mickey D's, but there were video games. Blast! Hello world. It's me, Pamela. I mean Amanda. I have no idea why I would accidentally call myself Pamela. Maybe I'm just tired. Or maybe I saw myself in a mirror today. Who knows. 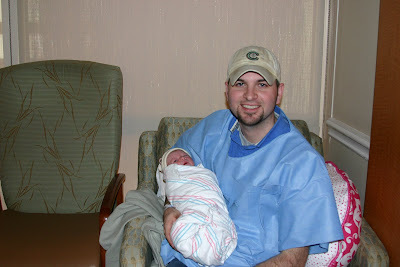 Annabeth and I were discharged from the hospital yesterday at about 2 p.m. I was afraid to leave my nurses who so mercifully dispensed painkillers at my request, but we were ready to get on with it. Today was our first full day at home together as a family of four. It was a good day. 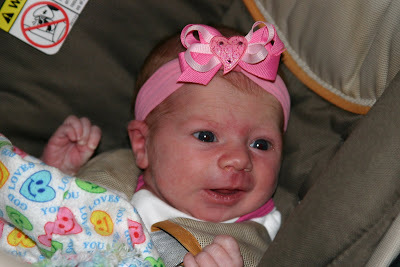 We had to take our baby girl to the doctor bright and early to get her bilirubin levels checked. She and I have different blood types, which apparently makes her more susceptible to jaundice. I felt like a zombie and I was exhibiting that just-gave-birth way of walking and sitting which are not really meant for public viewing, but it wasn't too bad. We have another appointment tomorrow for the same thing. Hopefully this will be the last one until her two week check-up. Basically, we sat around the house and I nursed the baby as much as humanly possible to help a little postpartum issue that I'm having. I took a nice two hour nap while Annabeth slept. I'm planning to be good this time and sleep while she sleeps as much as possible. Which means I need to go to bed and not be blogging! I have so much to say about this baby girl. She is amazing. We have already bonded so much. Today I held her while she was bundled up and sleeping and I filed her nails with an emery board. It occurred to me that I was giving my daughter her first manicure. What a sweet thought it was. And last night I did a huge load of pink laundry. How strange and wonderful to have pink as a category of laundry in our house! I could seriously keep writing for the next three hours, but I really need to go to sleep. I just want you to know that Hubs got me a cherry limeade and a big bag of ice from Sonic tonight. About twenty minutes ago I discovered a whole new reason to love Sonic ice. I'm sitting here shivering, but maybe tomorrow I can stop mistaking myself for some woman named Pamela. The night Annabeth was born, after everyone had left and it was just me and her and Curtis, I was compelled to dress her up. And of course I had to take pictures. 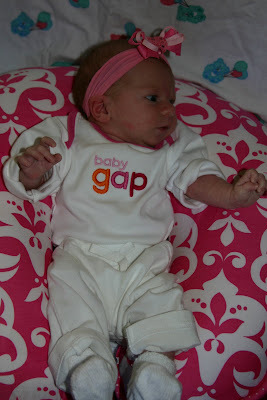 Here she is in her first outfit. 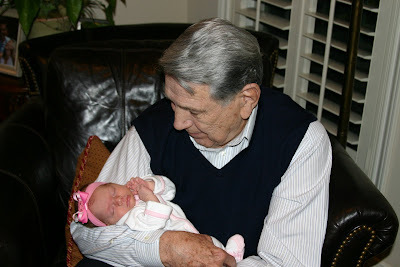 on Tuesday, February 3, 2009, at 11:38 a.m.
Little missy shares a birthday with her Pappaw Jones!